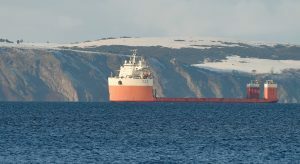 Hua Yang Long, a heavy lift ship from China which is anchored off Nairn and is believed to waiting to transfer oil rigs out of the Cromarty Firth. Picture by Sandy McCook. Hua Yang Long arrived at its present location on December 28, followed by Hua Hai Long on January 2, according to data from MarineTraffic. It is understood that they were booked to transport three rigs owned by US firm GMS. But Scottish environmental authorities blocked their exit amid concerns that the rigs will be taken illegally to India or Bangladesh to be dismantled. Hua Yang Long, a heavy lift transport ship from China which is anchored off Nairn and is believed to waiting to transfer oil rigs out of the Cromarty Firth. Picture by Sandy McCook. 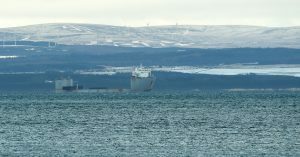 The heavy lift ship Hua Hai Long from China at anchor off Nairn. 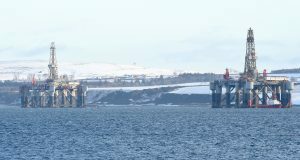 It is understood to be waiting to move oil rigs out of the Cromarty Firth. Picture by Sandy McCook. 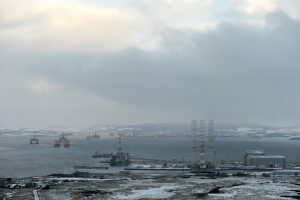 Oil rig twins, Ocean Princess (left) and Ocean Nomad in the Cromarty Firth awaiting shipment. Picture by Sandy McCook. The Cromarty Firth busy with oil rigs. Picture by Sandy McCook.